Since the creation of fire & coals, mankind has been attempting to perfect how to cook their food. Whether you are in the kitchen or out in the woods, there is something primal at the heart of cooking that makes us so enamored with it. We love to watch a piece of steak hit a searing hot pan and sizzle. We love to create something delicious out of raw and natural food. For the sake of convenience though, we have left some of that primal way of cooking behind. Technology now allows us to not have to worry about cooking as it will do it for us! We live in a world that is losing its in touch on creating its own food. So what do we do about this? I have learned that getting in touch with traditional ways of cooking is not that difficult. Although fun, you truly don’t need skillets, pans, ovens, grills, and all of the other gadgets to create delicious food. All you really need is a fire. Cooking on the coals from a fire is a very traditional way to create a meal. From historic cavemen to President Eisenhower (don’t believe me then look it up! ), cooking a raw piece of meat right on the coals is a delicacy and an art. All you need to make this work is white hot charcoal and a piece of meat or veggies. The beauty of cooking like this is that the searing heat from the fire cleanses the food that you are cooking. This allows the food to create a crust very quickly so that the coals do not stick to it. Once the food is ready, you can easily brush off any burnt crisps and enjoy your smoky flavored meal. That has to be my favorite part. 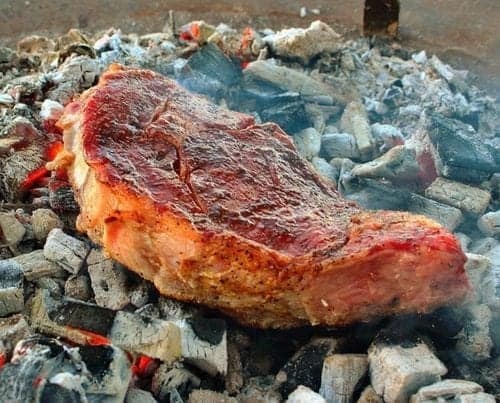 The flavor of the food when cooked on the coals is so unique to the palate. The food takes on the natural essence of the wood that you are cooking with. My favorite to cook with is hickory or pecan. These two woods are both smoky and sweet giving the meat a fantastic profile. Cooking like this does not have to be limited to just meat. Cook veggies, seafood and even bread on the coals. My biggest tip is to always pay attention to the food that is cooking. Food cooks quickly with how hot the coals are, therefore, do not take your eyes off of it! Make the fire out of natural wood or lump charcoal! Allow the charcoal to reach high heat (white hot) so that the food is easy to cook and clean. Try cooking different kinds of meat like rib-eyes, pork chops, lamb chops, and more! Eat your veggies from the fire! 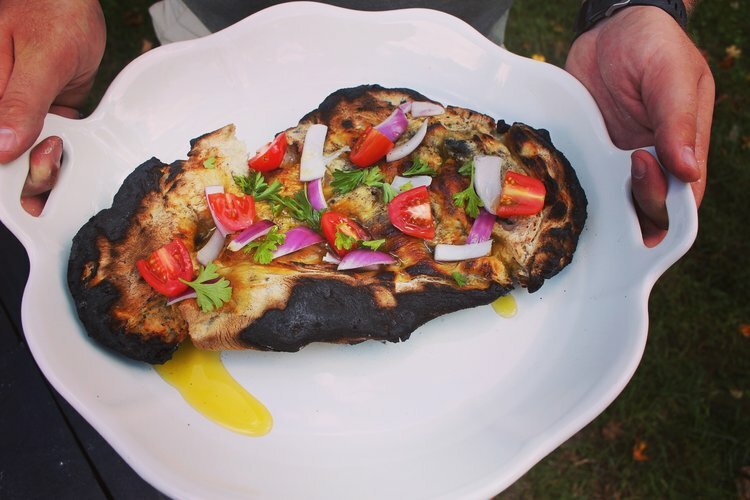 Throw squash, pumpkins, zucchinis and more on the coals for a smoky vegetable plate! Even cook bread on the coals! Avoid using briquettes as they contain containment for cooking on. Use protective equipment like pitchforks, gloves and more. Watch the fire and food carefully so that it does not burn. Things cook quickly so let someone else grab you another beer. What Outdoor Cooking Knife is Right For You?